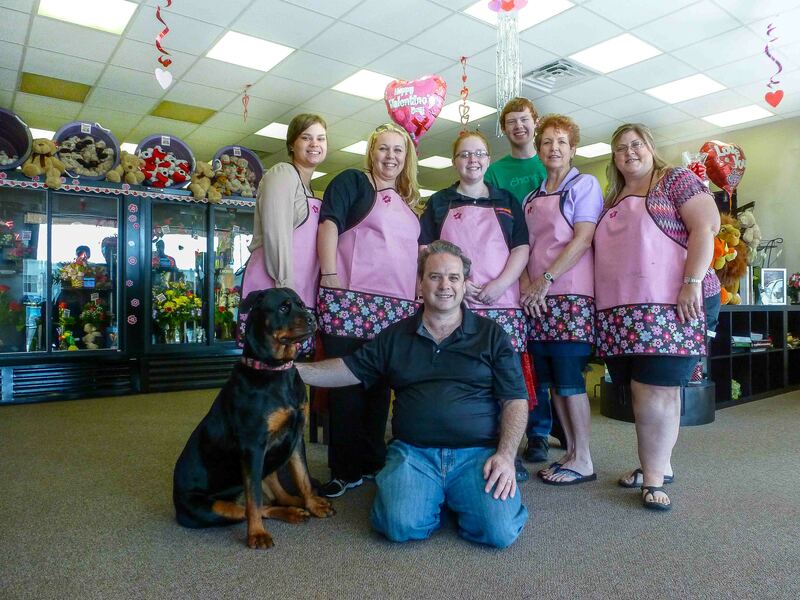 Flower Power is your local florist of choice proudly serving the Davenport, FL area since 2004. At Flower Power we are committed to your complete satisfaction provding the highest quality floral arrangements, plants and gifts where you are served by our team of professional staff dedicated to ensuring your experience with us is first class and your gift is perfect. Need your gift delivering to Davenport, Kissimmee, Haines City, Clermont, Celebration, Championsgate, Reunion or Lake Buena Vista, for same day free delivery? Call us before 2pm and we can make it happen. We can also arrange delivery of your floral gift anywhere in the continental USA and we can even deliver worldwide. 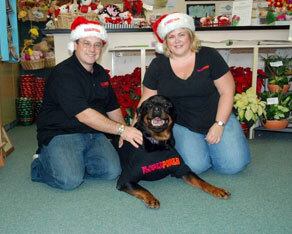 Flower Power is a family owned and operated real store with real people who really know about flowers. We pride ourselves on our friendly service and putting you the customer first and will do our very best to meet all your floral needs. 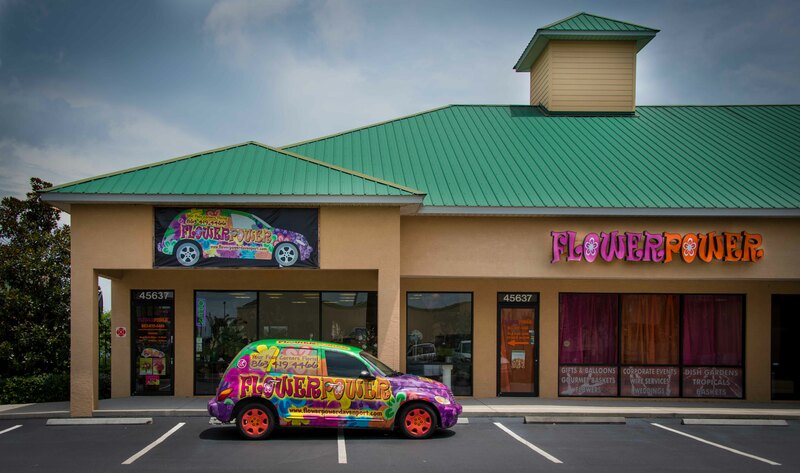 See our groovy car out and about and on holidays have your flowers delivered by our “flower child” delivery drivers complete with hippy costume! As well as local deliveries we can send flowers anywhere in the US and Worldwide. Flower Power was the brainchild of James and Helen Raynor and together with thier two dogs they relocated from England to Davenport, FL to make a new life in sunny Florida and set up Flower Power in Davenport in the heart of the growing Four Corners area. Helen trained in floral design at the acclaimed Judith Blacklock school of floristry in London, England and established Flower Power in 2004. 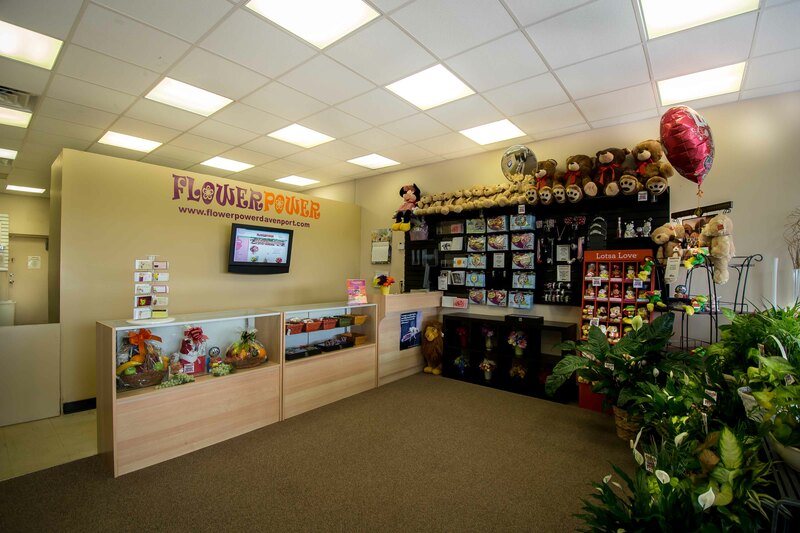 Flower Power has also received a Teleflora "Award of Excellence" in recognition of providing top quality service and products and in 2010 the store was expanded to over twice the original size and give an even greater area for display for customer choice. Visit our store to see our exciting range of ever changing seasonal goods or just drop by to browse around. 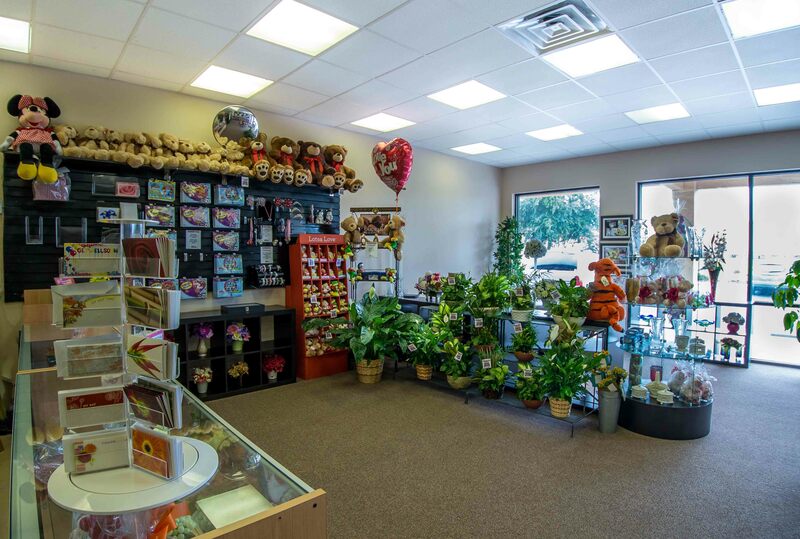 We have a wide variety of fresh flowers, dish gardens and plants, balloons, singing balloons, plush animals, silk flower arrangements and decorative containers and gifts to take away with you or have delivered. We can also put together gift baskets of fruit and gourmet products or a candy and snack basket. Getting married in Florida or live locally? 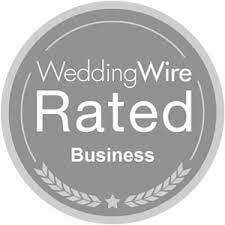 We also specialize in weddings and can make your dream come to life! Need to place an order out of these hours? Simply call us and we can answer any questions or take your order over the phone. 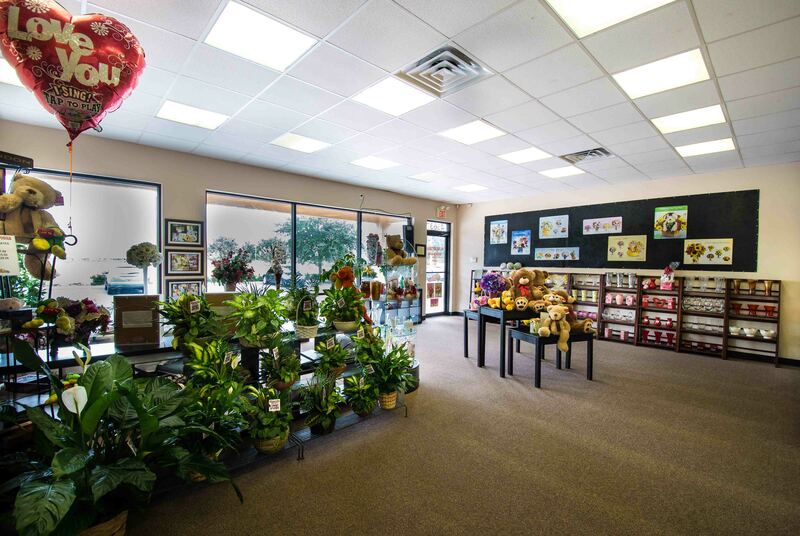 Our shop directly serves by local delivery the following areas in Florida: Davenport, Celebration, Reunion, Kissimmee and Loughman. We deliver to local hospitals including Celebration Health hospital and Heart of Florida hospital. We also deliver daily to local schools, colleges, churches and funeral homes including Holmes Funeral Home, Oakridge Funeral Home and Crossroads. Flower Power is also conveniently located close to the Omni Orlando and Championsgate resort and Golf Club as well as the Disney resort areas and Gaylord Palms Resort together with the many of the vacation homes areas along US 27 and US 192. Davenport, FL 33897 From I4 West. Take exit 58 and head right towards Championsgate Golf Club and the Omni Orlando Hotel. Follow the road for approximately 1 mile until you reach a T intersection. Take a right onto Ronald Reagan. Drive for approx 2 miles and you will reach a Walgreens on your right directly before you reach the intersection with US Highway 27. Turn right before Walgreens and Flower Power is located directly in the mall of shops in Ridgeview Plaza. From 192. Heading West on US 192 enter US Hwy 27 heading South towards Haines City. Stay on US Hwy 27 for approx 6 miles. Turn left at the junction of Ronald Reagan which is identifiable by the Walgreens on the corner. Drive past the Walgreens and take the next left and Flower Power is located directly in the mall of shops in Ridgeview Plaza. From I4 East and US Hwy 27 South.Take exit 55 and head onto US Hwy 27 North (Clermont). Head North on US Hwy 27 for approximately 2 miles and Flower Power is located in the Ridgeview Plaza located on your right at the intersection with Ronald Reagan.